The unique architectural features of the Tatarstan town of Elabuga include a number of school buildings from the early 20th century. Situated on a high bluff looking over the broad plain of the Kama River, Elabuga (population slightly over 60,000) is especially favored by its physical surroundings. The artist Ivan Shishkin, renowned for his paintings of Russian nature, grew up in Elabuga, and his family house, with its view of the sweeping vistas over the Kama, is now a museum. The surrounding pine forests seem to provide the air with a fragrance and freshness even within the town itself. Elabuga was founded as a Russian settlement in the latter part of the 16th century, a time of expansion of such settlements on Russia’s southern and eastern frontiers. In 1780, it was designated a town in Vyatka province as part of Catherine the Great’s reform of Russia’s urban administration. By the end of the 19th century, Elabuga not only had become a thriving trading center by virtue of its location on a major tributary of the Volga River, it also had established a number of small-scale industrial enterprises, such as metal working. Elabuga’s entrepreneurial spirit played a significant role in the creation of its harmonious 19th-century architectural environment, much of which has been preserved to this day. Merchant dynasties such as the Stakheevs, the Girbasovs, the Chernovs, and the Ushkovs not only built houses for themselves, but also gave generously for the construction of churches, a convent, and a number of schools. The oldest architectural monument in Elabuga far predates the town’s 19th century ensemble. 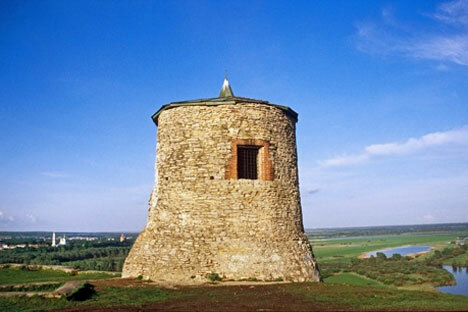 Situated on a hill above town, the tower at Devil’s Fort (Chertovo gorodishche) is thought to contain fragments dating from the end of the first millennium A.D., when the site was settled as part of the Volga Bulgar state. Restored in the 1860s, the tower and its park offer a wide view of the Elabuga area. From here it is easy to see the historic town’s primary monuments, such as the Cathedral of the Miraculous Icon of the Savior, a large domed structure built between 1808 and 1816 in a neoclassical style. Its bell tower is one of Elabuga’s tallest structures. The cathedral interior was ransacked during the Soviet era, but its restoration is slowly proceeding. Better preserved is the Church of the Intercession of the Mother of God, also built at the beginning of the 19th century in the neoclassical style. Its wall paintings have been largely restored, and this active parish church has a new iconostasis. Elabuga also has as substantial Muslim population, for whom the center of religious activity is the new building for the main mosque, which features a tall, narrow minaret. Elabuga’s many houses from the 19th century are in various states of repair, but one area in which they have been superbly restored in Bolshaya Pokrovskaya Street. The patron of this restoration is an unlikely source: a school for the training of police cadets. A long section of street, featuring 19th century houses built for prosperous merchants such as the Stakheevs, the Mylnikovs and the Chernovs, was granted to the school with the understanding that it would maintain the structures as historic monuments. They have done so not only on the exterior, but even on the interior, where parts of the wood and plaster work have survived. The adjacent Embankment Street also has a number of well-preserved monuments from the same period, as does Kazan Street. But perhaps the best reflection of the level of culture sponsored by this merchant town is the number of its educational institutions built in the late 19th and early 20th centuries. Some of them were connected with the Orthodox Church. There was also a school for the blind. The most impressive of these institutional buildings is the former Women’s Eparchal School, now the Elabuga State Pedagogical University. Completed in 1903 in a Beaux Arts design by the Vyatka architect Ivan Charushin, the grand brick building and its wings is a self-contained center of learning, a superb tribute to education and culture. Near the Pedagogical University is a monument to the great poet Marina Tsvetaeva, who in the desperate fall of 1941 lived as a refugee in a small wooden house nearby. It was here that her tragic odyssey ended with suicide. The monument is in the form of an open half-rotunda with white-channeled columns surrounding a bronze bust on a granite column. The design is rather large, but it without doubt brings attention to the complicated but gloriously creative life of this Russian writer. Elabuga is one of many little-known treasures in the Russian provinces. There are several factors that contribute to the health and rich cultural diversity of this town, and the town’s historic architecture is among them. Here, as elsewhere, concern for architectural heritage is an important indicator of a promising future.